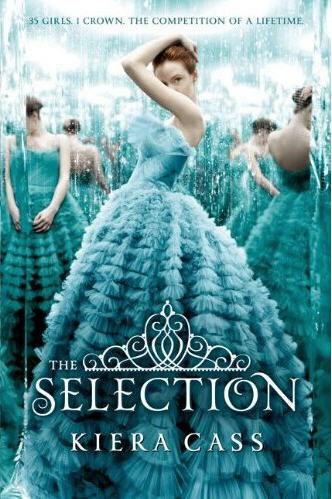 In the YA community, Kiera Cass’ new book, The Selection, has been buzzing for a while, especially after The CW picked up the rights to adapt it into a TV show. So of course, I was curious. The CW’s answer to Twilight was the very successful Vampire Diaries, and it appears that their answer to The Hunger Games is The Selection. They’re both set in future dystopian America, but that’s really all they have in common. Basically, The Selection is what a combination of the Miss America Pageant and The Bachelor would be like in a future dystopian world. To be honest, after all the dreary dystopian books I’ve been reading, this seemed like an oddly refreshing premise. After reading it, The Selection is a fast, enjoyable read, despite its predictability. The Selection takes place in Illéa, a country that rose from America’s ruins after the fourth world war. A monarchy presides over the country, and citizens are divided into castes running from 1 (royalty) to 8 (homeless). America Singer is a Five, which means she was born into a caste that entertains people with music and art. But being a Five also means a low income and occasionally starving for food. Hence, when the Selection comes up, America’s mom is more than eager to sign her up. The Selection is reality competition show where the kingdom “randomly” invites 35 young women to the palace to win over the Prince’s heart and become the future Queen of Illéa. Being chosen as one of the Selected means being upgraded to a higher caste and weekly checks being sent to each girl’s family. To her mother’s dismay, America wants nothing to do with the Selection, particularly because she’s been carrying a secret relationship with Aspen, a Six. But after being bribed and convinced, America signs up… and she gets chosen. How can America go through the Selection when her heart is elsewhere? America is the typical stubborn girl that’s really nice but doesn’t want to go through something that you know she’s going to go through anyway. While I like America, I’ve met numerous characters like her before. Aspen is not exactly unique either, but it’s trult their relationship that feels familiar. After those characters were established, I sort of expected Prince Maxon to be slightly cocky, sarcastic but well-meaning. Surprisingly, his character wasn’t. He ends up keeping America on her toes by being genuinely nice, sincere and just plain cute. It’s really hard to not find the guy endearing. I think his only flaw is being a little too perfect. But besides that, his exchanges with America are the best part of the novel. The author doesn’t go into depth about Illéa and the government. I mean, we’re given adequate information to understand why particular things are happening, but it doesn’t delve much further than that. I think this world can be pretty fascinating if we knew more about it. Throughout the story, the palace deals with rebel attacks. They’re vaguely explained, and I’m seriously hoping that we get further explanation in the subsequent books. The Selection is a quick read. And I was right to think the whole Bachelor idea would provide something refreshing to the YA dystopian genre. Unfortunately, it does follow the same formula that many other YA books have. Yet, I do like the characters, and I’m curious to see what will happen to them next. In a way, the book is very much like a reality show. You know it’s probably scripted or not very good, yet you somehow can’t deny how entertaining it is and just can’t stop watching/reading. The Selection is available to purchase in our TYF Store, powered by Amazon.